The P30 offers the same flagship-grade performance as its older sibling and will surely settle at or near the top of the Android leaderboard. Huawei’s P30 and P30 Pro that were recently unveiled in Paris are scoring major headlines for their impressive specs and improved camera capabilities. And, soon Indian consumers will get their hands on these top-tier flagships as a dedicated listing page appears on Amazon India. The P30 Pro is undoubtedly one of the biggest flagships of 2019. According to DxOMark, the P30 Pro features the best camera setup on a smartphone to date. 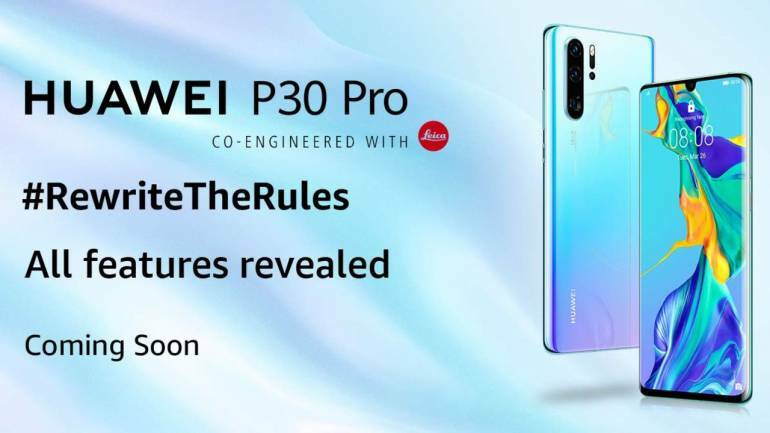 Huawei has partnered with Leica to bring revolutionary new features and a never-before-seen level of clarity to the P30’s four-camera layout at the back. Even the front camera on the P30 Pro boasts a 32-megapixel sensor for crispier selfies. Add to the fantastic camera; you get a gorgeous prismatic, full-glass finish, an immersive AMOLED display, a powerful and power-efficient 7nm chipset, a big battery capacity with software tweaks to improve battery life and last but not least a 40W SuperCharge technology to replenish that big battery in no time. The P30 offers the same flagship-grade performance as its older sibling and will surely settle at or near the top of the Android leaderboard. The P30 losses the fourth ToF camera at the back, get a smaller screen and battery capacity and 25W charging support.